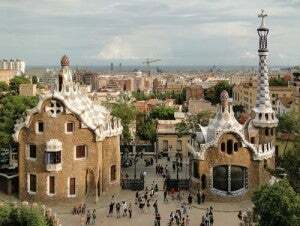 The Park Güell in Barcelona is located in the small district of Gracia. This area is known for its high population density and the countless tourists who come all year round to admire the beautiful architectural work of Catalan artist Antoní Gaudí. For this reason, it is not surprising that it is far from easy to park near the Park Guell. Firstly, there are numerous pedestrian areas throughout the city, especially in the popular areas, which make driving around the car pretty difficult. Even if you are lucky and find one of the few available public parking spaces, you still have to bare in mind that it’ll be subject to different rules and regulations depending on its zone, plus you have to pay for them and there’s time limits. In the green zone is mainly for residents, as a visitor you can park there for 2 hours and in the blue zone you can park for a maximum of 4 hours. But be careful, follow the rules to the T to avoid getting fined. Or you can make the parking easier from the start by reserving a parking space near Park Güell in advance. Parclick offers secure car parks in Barcelona. Look at the map on our website and find a suitable one that meets all of your requirements. Treat yourself to a relaxing and stress-free stay in the Catalan capital and reserve your car park now! Parque Güell or the Park Güell is undoubtedly one of the best-known attractions in Barcelona. The work for the park began in 1890, after Eusebi Güel commissioned famed Catalan architect Antonio Gaudí to build a garden town, which overlooked the city. The original idea of a luxury residential area soon became a huge garden full with different architectural pieces to form a wonderful fairytale garden! This unique park is, after the Sagrada Familia, the second-largest of Gaudí’s project. It was declared a UNESCO World Heritage Site in 1984, so it’s pretty important, not to mention cool ;) The entire park is dominated by wavy shapes, animal figures made out of coloured mosaics and many other wonderful details. A special landmark, which is not to be missed is the Friendly Dragon at the entrance of the Market Hall. Plus, to feel even closer to Gaudí, you can see where he lived from 1906 to 1925, and now you can see a collection of his work. If you're feeling like checking out some more of Gaudí's masterpieces then how about checking out La Pedrera? So to get your visit to the Park Güell off to the best start, book your parking with Parclick!